Artist dialogue with Rabbi Burton Visotzky about the making of the megillah at 6pm. Rabbi Visotzky is Professor of Midrash and Interreligious Studies at Jewish Theological Seminary-New York. Originally from Bombay, painter Siona Benjamin was raised Jewish in a predominantly Hindu and Muslim India. Now living in the US, Benjamin creates work that combines the imagery of her past with the role she plays in America today. Her work is inspired by both Indian miniature paintings and Jewish and Christian illuminated manuscripts. The Esther Megillah (above) is the basis for the Jewish celebration of the festival of Purim. Artist Siona Benjamin received a commission to paint a megillah (Esther scroll read during the festival of Purim) from a private Jewish art dealer in New York. The original Book of Esther is one of the books of the Ketuvim (Writings) of the Tanakh (the Hebrew Bible) and of the Historical Books of the Old Testament. The Book of Esther or the Megillah is the basis for the Jewish celebration of the festival of Purim. Benjamin is currently studying Midrash with Rabbi Burton Visotzky at JTS in New York. 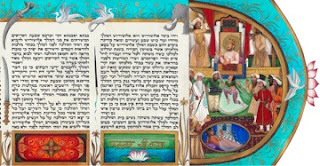 She was commissioned to paint the megillah using influences from Indian and Mughal miniature painting. She also uses iconography from her own paintings to make the megillah unique and personal. Besides the above influences Siona also researched current topics and happenings from the news to be able to connect to this ancient story. In the process of recycling old and new, it reminded her while making the work (and hopefully the audience in viewing the work) that myth making is cyclical and timeless. The Megillat Esther is a story we can also hear today. This exhibit will also display some of the influences and sketches that went into the making of the scroll. Subway: R/N to 8th St./NYU; 6 to Astor Place; A/C/E/B/D/F/M to W. 4th St.